Richard Mauze Burr is a traitor. Richard Mauze Burr is a treasonous United States Senator from North Carolina. In early March 2015, the Senate Intelligence Committee advanced a terrible unconstitutional cyber security bill called the Cybersecurity Information Sharing Act of 2015 (CISA) to the Senate floor. 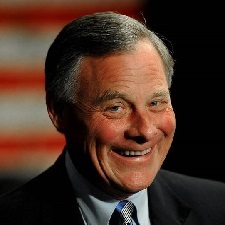 Therein, the new chair (and false supporter of transparency) Senator Richard Burr may have set a record as he kept the bill secret until Tuesday night (March 17, 2015). The Cybersecurity bill aims to facilitate information sharing between companies and the government, but the broad immunity clauses for companies, vague definitions and aggressive spying powers make it a secret surveillance bill. The bill adds a new authority for companies to monitor information systems to protect an entity’s hardware or software. The broad definitions could be used in conjunction with the monitoring clause to spy on users engaged in potentially innocuous activity. Once collected, companies can then share the information, which is also called “cyber threat indicators,” freely with government agencies like the NSA. Such sharing will occur because under this bill, DHS would no longer be the lead agency making decisions about the cyber security information received, retained, or shared to companies or within the government. Its new role in the bill mandates DHS send information to agencies—like the NSA—”in real-time.” The bill also allows companies to bypass DHS and share the information immediately with other agencies, like the intelligence agencies, which ensures that DHS’s current privacy protections won’t be applied to the information. The provision is ripe for improper and over-expansive information sharing. Once the information is sent to any government agency (including local law enforcement), it can use the information for reasons other than for cybersecurity purposes. The provisions grant the government far too much leeway in how to use the information for non-cybersecurity purposes. The public won’t even know what information is being collected, shared, or used because the bill will exempt all of it from disclosure under the Freedom of Information Act. In 2012, the Senate negotiated a much tighter definition in Senator Lieberman’s Cybersecurity Act of 2012. The definition only allowed law enforcement to use information for a violation of the Computer Fraud and Abuse Act, an imminent threat of death, or a serious threat to a minor. The Senate Intelligence Committee’s bill—at the minimum—should’ve followed the already negotiated language. The bill also retains near-blanket immunity for companies to monitor information systems and to share the information as long as it’s conducted according to the act. Again, “cybersecurity purpose” rears its overly broad head since a wide range of actions conducted for a cybersecurity purpose are allowed by the bill. The high bar immunizes an incredible amount of activity. Existing private rights of action for violations of the Wiretap Act, Stored Communications Act, and potentially the Computer Fraud and Abuse Act would be precluded or at least sharply restricted by the clause. It remains to be seen why such immunity is needed when just a few months ago, the FTC and DOJ noted they would not prosecute companies for sharing such information. It’s also unclear because we continue to see companies freely share information among each other and with the government both publicly via published reports, information sharing and analysis centers, and private communications. This unconstitutional and fatally flawed bill is not cyber security, it’s a surveillance bill upon ‘We the People’. It should be further noted, Senator Richard Burr will undoubtedly continue his treasonous acts in seeking to destroy our privacy protections along with granting new unconstitutional spying powers to all levels of government, including between companies and the government. Senator Richard Burr, is a pro-waterboarding conservative who wants to give Obama more power. In elementary civics class, everyone learns about James Madison’s vaunted “separation of powers.” The idea is that if you don’t want a tyranny to develop in your society, you need to empower separate institutions who will, hopefully, jealously guard their own prerogatives from encroachment by other parts of the state. “Ambition must be made to counteract ambition,” he wrote. That idea might have been taken a bit too far in American constitutional design, but one thing Madison definitely didn’t anticipate is that members of institutions might be complicit in gutting their own power. Power-seeking is one of the most reliable motivators in history, especially for the political class. But with the case of Richard Burr, we see a senator who would be complicit in his own institutional disenfranchisement. Back in March 2014, the CIA was fighting desperately to prevent the release of a Senate Intelligence Committee torture report which exposes the torture program as the monstrous and illegal farce it in fact was. In turn, Senator Mark Udall (D-Colo.) has been one of the most prominent critics of the security apparatus, and he’s been near the center of the CIA-Senate fight. On one level this is merely typically monstrous Republican partisanship. Accusing Democrats of basically supporting the terrorists is standard GOP practice. And there’s an individual motive, too: Burr is the number two Republican on the Senate Intelligence Committee, and since number one Saxby Chambliss is retiring, should Republicans retake the Senate in 2014 Burr stands to gain the committee gavel. But consider the deeper implications: Should he succeed in his attempt to undermine Senator Udall to save the CIA torturers, he will have won the chair of a rump Intelligence Committee with no power or influence. Having lost a straight oversight fight with the CIA, everyone will know they might as well not even bother to meet. The strangest thing is that Senator Burr doesn’t seem to be much disturbed by this. Indeed, he seems positively eager to stop this whole fight and give the security apparatus whatever they want. …the conceit at the center of all of these surveillance programs — of almost the entire idea of a secret intelligence community in a democracy — is that you have elected representatives of the people who are allowed to know what they’re doing and keep checks on it, even if these things have to be kept secret from the general public. It’s only under these circumstances that you can plausibly think that level of secrecy is compatible with a democratic system. But Senator Burr’s treasonous brand of reactionary conservatism assumes that the security apparatus is always right. It ranks above personal political or institutional ambition, and even partisanship. Remember, this is President Kenyan Muslim Socialist’s executive branch agencies we’re talking about. But even the frenzied Republican hatred of Obama doesn’t stack up against protecting the CIA’s ability to commit torture with impunity. Especially when it’s being supported and defended by the traitor Senator Richard Mauze Burr. This entry was posted in Traitors and tagged Richard Burr, Richard Mauze Burr, Senate, Senator, Traitors, Treason. Bookmark the permalink.